We are open and flying from the Skyline Gondola today. Please ensure you check our Flying Status 30 minutes before your Check-In time, and before you come up the gondola. Expect waiting time to access the Gondola. Haven’t booked with us yet? Please contact us to book your flight early, as we’re going to be busy today. Or you can book online right here. Tandem Paragliding over Queenstown, New Zealand! Fly with the largest and most experienced paragliding company in New Zealand…. 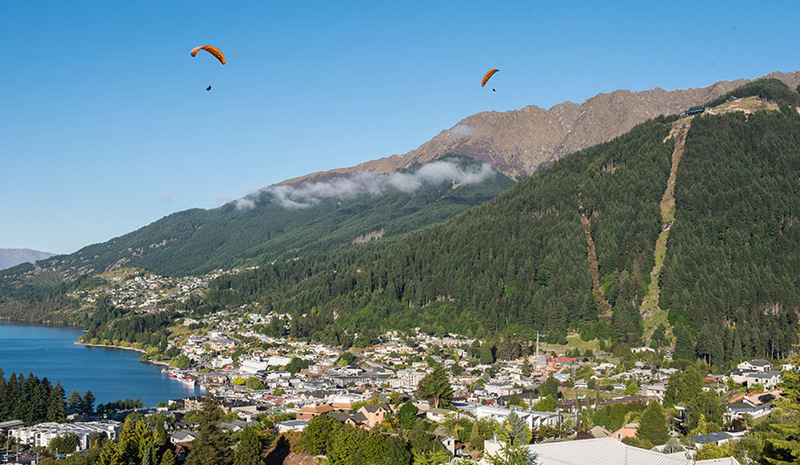 We’ve been tandem paragliding over Queenstown since 1991! Take off from the top of the Skyline Gondola and experience the ultimate in free flight as we soar over Queenstown. Catch the morning light and tranquility over Queenstown with an early-bird flight from the Skyline Gondola. Available every day. Weather dependent. Bookings can be made online here or by calling our bookings office direct on 0800 759 688. Looking for a unique present? Gift vouchers can be easily purchased online right here. We are located at the top of the Skyline Gondola in Queenstown. When you arrive at the top of the Skyline Gondola, please follow signs for GFORCE Paragliding. "Three members of my family: myself, wife and son (age 9) went paragliding today. I can’t say enough about how much each of us enjoyed the experience! Thomas, Dan and Steve were amazing guides!!! This was the first time any of us had done this and it could not have been better. We felt safe, confident in our guides and experienced Queenstown from a whole new perspective!"